Go Launcher dialer Help Please! Discussion in 'Android Apps & Games' started by ClarePenn, Sep 27, 2011. When I touch the default 'hand set' that comes up with Go Launcher, to get to the phone functions, it always brings up the dialer. 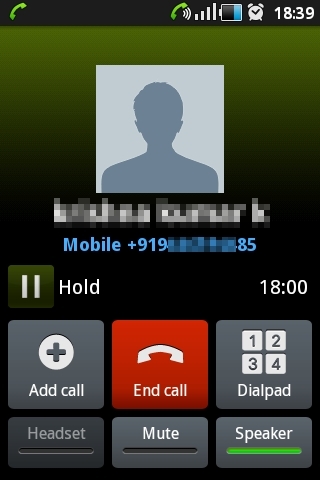 I'd like it to default to 'Recent' or for it to come back to where I left it (Dialer-Recent-Contacts-Favorites). Is there a way to make any of this happen? Thats because Go Launcher doesnt come up with its own dialler, but it just links to the phone app on your. You'd have to check its settings if you want it to default to recent, if it allows that. What you do now is change the shorcut on the dock (long press it, select delete (replace changes icons), then click the "+" button that is left behind, select applications>choose go dialer). ...I wish I knew how to check the settings on whatever it is Go Launcher is linking to - I am quite illiterate in much of what my phone is doing! The out-of-the-box system as it was before I installed Go Launcher (Motorola DroidX) did do the phone how I like and I'm trying to get just that bit back to the way it was before Go Launcher. I have pressed the button that usually gets you 'more options' and sometimes one of those options is 'settings' or 'config' but not so in this case. Maybe there is somewhere else to look? Ahhh, but wait, I actually am getting one 'Most recent' entry above the dialer (but it won't scroll like it looks like yours does) so that makes me think I might be running Go Contacts. I'd like to try to uninstall that but I can't find it! Could you point me in that direction? To see if the recent list scroll, press the button to the left of the green "call button", that would slide the dialpad out and hide it, and then you can see just the recent contacts list. It may not scroll if it only has a short list. And by the way, that picture is not mine. Just got it off the app page. I was feeling a little lazy to blot out the numbers if I took a screenshot on my phone. Anyway, if you are using Go Contacts, instead of Go Contacts EX (extended version), you should upgrade, its free anyway, it could be the reason why its not scrolling. Since you are running Go Launcher, it should be pretty easy to uninstall. Just open the app drawer, and look for Go Contacts. It might be easier to look for it if you set it to alphabetical sorting (menu>sort>alphabetical>ok). Long press the Go Contacts icon and then you will see a little red x button on the upper right of the icon. Pressing that will initiate the uninstall process. PERFECT! I didn't have Go Contacts but I installed Go Contacts EX and it works even BETTER than the original one (whatever that was I never figured out). It remembers what you did last, you can just touch that recent list to make a call or scroll and the keypad goes away, all fab. However...I made a call by mistake (touching a contact) and then I couldn't figure out how to hang up (I was touching away like a crazy person!)! and I didn't see the speaker button either. I'm sure in time all will be revealed but maybe if you're up to doing another good deed and you can point me in the right direction. So whatever screen you are seeing now is not part of the Go Contacts app, but rather your phone's own in call screen. I tried it again and indeed the big red button did reveal itself. I was talking on the phone...it wasn't there before... You are a kind and patient soul. However, if I go to any other screen, I can't get back to that keypad. If I go to the dialer in native app or Go (same one), the button isn't there (looks like it would be before dialling) but the call is still connected. There is no way to hang up! I uninstalled and went back to the factory dialer and contacts, which isn't that bad anyway. The only things I miss about GO Contacts EX is that it had the alphabet down the right side in contacts, and the recent calls mixed in the dialer screen, and swipe left and right between screens. Actually, pull down notification bar. You see the controls for end, mute and loudspeaker. Then if you press the phone icon, you go back to call screen.